Thailand is a country of cat-nappers. Wherever I travel, I see plenty of people who, in their boredom, lethargy, or exhaustion, take every opportunity to shut their eyes and rest. Maybe it is the heat and humidity? On the list of jobs I would not want to have is the motorcycle taxi driver or khon kap rotmotorsai. While the offices of Bangkok are filled with women, the men from the countryside find jobs like this one. For a fee paid to the mafia and a license paid to the government, they receive a colored vest and an assigned stand at the mouth to one of the city’s many long soi or alleys. Inhospitable to pedestrians, the soi are usually too narrow, too winding, and too sparsely populated to justify mass transit. Instead, we flag down a rotmotorsai, hop on the back, and whiz our way to the mouth of the soi where we catch a taxi, bus, or train onward. Dangerous? Yes. 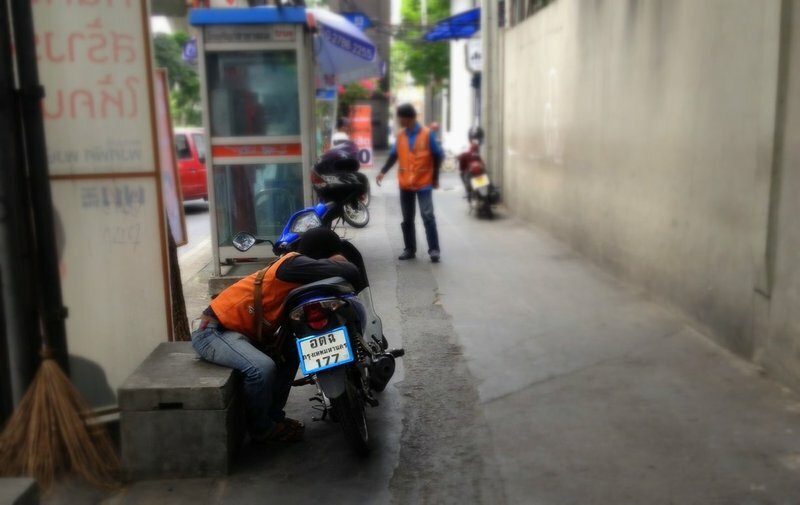 I only ride the motorcycles on our soi, where the drivers recognize me as a regular and are familiar enough with the traffic on the street to know where caution must be paid. Why are our streets laid out in a network of long, narrow soi? It is thanks to the rice-growing past of the central plains of Thailand. As you can see in the picture above, rice paddies were laid out in long, narrow strips that connected to a main canal or road. As the paddies were drained, paved, and developed (the housing developments are the strips of mostly red roofs) the streets followed the long, narrow contours of the agricultural past. A map of Bangkok shows that legacy: thoroughfares a kilometer or more apart with long, narrow streets stretching out from them. Few of those streets, though, connect the larger thoroughfares. The result is that many of us live some distance away from major streets and if we aren’t driving, have to find our way out of the soi under an unforgiving sun. It’s enough to make you cave in an ride on a motorcycle taxi or, perhaps, to want to take a nap. This entry was posted in Uncategorized and tagged Bangkok, culture, Motorcycle, Motorsai, Nap, planning, Rest, Sleep, Soi, street, Thailand, urban by christao408. Bookmark the permalink. I am totally scared of motorcycles. Period. I have seen enough accidents on the freeway here. I feel the chills thinking about it, esp after i was run over by a motorcycle Bangkok, and ambushed by several in Saigon. No way, man. I think I’d feel compelled to purchase my own helmet… and life insurance! I thought the orange vest meant they passed a comprehensive & rigourous test. I remember an earlier entry about sois and link back to the rice paddies and canals. Bangkok must be an urban planner’s dream and nightmare.